Firstly, from Sunderland City Centre, follow the River Wear upstream for five miles and discover Penshaw Monument. Indeed, this old folly is the North East’s biggest and best loved landmarks. Penshaw Monument has symbolised and represented the North East for over 150 years and will continue to do so. In fact, the monument or folly, is the best specimen of a Doric Hexastyle temple in Britain today. It has the officially name, The Earl of Durham’s Monument, but we all know it as Penshaw Monument. As a matter of fact, this 70 foot high folly is a replica of the Temple of Hephaestus in Athens. On the whole, it is visible from Wearside, Tyneside and much of County Durham. Of course, in 1974 there was a forced marriage between Wearside and Tyneside. Thus, the unloved county of Tyne and Wear came about. Obviously until then, Penshaw Monument was in County Durham as was Sunderland! However, as the saying goes for North East folk ‘once you can see Penshaw Monument, you know you are home’. The monument is 30 metres (98 ft) long, 16 metres (52 ft) wide and 20 metres (66 ft) high. The columns are also 2 metres (6 ft 7 in) in diameter with one having a spiral staircase to the top. Indeed, we see the doorway in the image. John and Benjamin Green designed it while Thomas Pratt of Sunderland built it, based on the Doric order. The Monument utilised gritstone from the Marquess of Londonderry’s quarries on the east coast. Moreover, steel pins and brackets hold the stone blocks in place. Thomas Dundas, 2nd Earl of Zetland (the Grand Master of the United Grand Lodge of England) laid the foundation stone. In fact, the date was 28th of August 1844. This was also four years after the death of John George Lambton. In September 1939, John Lambton, 5th Earl of Durham, gave Penshaw Monument to the National Trust. Disaster struck on Easter Monday 1926 when a 15-year-old boy fell to his death from the top of Penshaw Monument. The boy, Temperley Arthur Scott, was with three friends and 20 other people when the accident happened. They had reached the roof via the spiral staircase in one of the pillars. Witnesses said that the boys went round the roof walkway twice before deciding to make a third circuit. However, Scott fell trying to avoid the other visitors. Of course this happened when he was passing around an open end where there was no protecting wall. After that incident, the spiral staircase to the roof became closed to the public. There was a special opening on 29 August 2011. Moreover, on this day, the public were able to access to the spiral staircase. This, of course, gave them some spectacular views from the top of the Monument. Obviously, this was an initial test to see if it was popular enough to open again for future one-off days. The National Trust did not take bookings for this occasion, the public simply turned up on the day. News that Penshaw Monument was to hold an open day obviously spread far and wide. As a result, this information reached many Wearside and North East exiles. Consequently, they jumped at the chance of climbing to the top. It was so popular that more than 2000 people turned up. Indeed, they were hoping to experience the thrill of reaching the roof of the monument. However, not all those who turned up were able to go to the top of the Monument. In fact, most never got access at all. This was because there was simply not enough time to allow everyone access to the roof. However, they had an option to be first in line on the next open day. Underpinning took place in 1978 owing to settlement due to mining beneath the hill. In fact, the next year, the entire western end had a facelift. This was because some damaged lintels needed replacing. On the whole, this was a painstaking job removing the material block by block. Sunderland council obviously use Penshaw Monument’s image heavily. In 1988, they invested £50,000 in floodlights. So, at night, we can still see the monument from miles away. Also, the monument features alongside other Wearside history on the badge of Sunderland Football Club. Indeed, Penshaw Monument stands majestically on the banks of the River Wear in the City of Sunderland. It is also the best landmark anywhere in the North East. In fact, you know you are home when you see this monument. Penshaw Monument stands loud and proud for all to see. Many people visit this magnificent structure and you will rarely be alone should you visit the monument. It obviously is a perfect backdrop for wonderful photoshoot opportunities. However, there are many countryside walks on and around Penshaw Hill. Opposite the monument is the Herrington Country Park, on the site of an old colliery. This is a haven for wildfowl on the many large lakes and there is even a play-park for the kids. So, the whole area is available for many a picnic or country stroll etc. 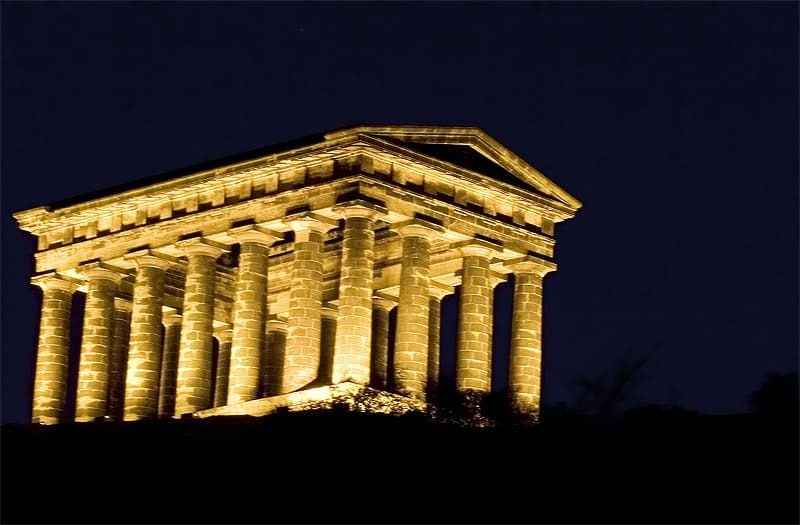 If you have any special memories of Penshaw Monument or the surrounding areas, let us know. You can leave us a comment in the box below or use the large Sunderland Message Boards (SMB). The Sunderland Forum is suitable for all the family as we only allow decent, common sense posts at Wearside Online! Tagged earl of durham, john george lambton, penshaw monument, temperley arthur scott, thomas dundass. Bookmark the permalink.